Tasmanian Hotels Association chief Steve Old, left, and Love Your Local campaign’s Michael Best campaign for poker machines. Tasmania’s two major political parties are taking drastically different approaches to the March 3 election as a hung parliament looms. Will Hodgman’s Liberal team will focus attention on the economy and the improvements made to the state’s finances and prosperity after one term of a majority Liberal Government. Tasmania’s health system will be the number one priority for Labor under new leader Rebecca White. Major policy announcements have started to roll out. The Liberals have released a number of polices aimed at the business community. Treasurer Peter Gutwein said cutting payroll tax would encourage Tasmanian businesses to invest and create more jobs for Tasmanians. “Under our plan, while all businesses will benefit, small to medium businesses with wages bills between $1.25 million and $2.0 million will see savings of up to $15,750 per year – representing a tax cut of up to 34 per cent for these businesses,” Mr Gutwein said. The Liberal Party also released a Regional Jobs and Investment Incentive, with a package targeting the creation of 600 new regional jobs by providing payroll relief for up to three years for any business that relocates to Tasmania and establishes its operation in a regional area. Heath is Labor’s big-ticket item. A majority Labor government would invest $560 million to recruit up to 500 additional staff across Tasmania’s entire health and hospital system over the next six years. The package includes offering 100 more graduate nurse positions, recruiting to fill nursing vacancies, 20 hospital doctors, 25 ambulance paramedics and the funding of 32 GP internships. The most contentious issue of the lead up to polling day so far has been Labor’s big gamble to distance itself from the gaming industry. Labor’s key policy of removing poker machines from all pubs and clubs has been welcomed by members of the health and social service sector but is being targeted by those most likely to lose their jobs under the plan, with pubs and clubs across the state accusing Labor and Greens of being elitist. High-impact banners, posters and billboards have been rolled out throughout Tasmania this week, with two messages, “Labor thinks you are stupid’ and “Save our jobs, vote Liberal”. Forestry is another issue that will likely come to the fore. The Liberals have been criticised for announcing a $43 million loan and assistance package to secure the development of Australia’s largest plantation-based hardwood mill and the first ever hardwood cross-laminated production plant during the campaign. Hermal Group will build a new $190 million hardwood mill plant, creating 221 jobs, at Burnie. “This will be an absolute game-changer for Tasmania’s North-West and North”, Premier Will Hodgman said. The majority of timber supply will be sourced from Forico plantations in the North-West and North but it is expected there will also be opportunities for smaller Tasmanian private forest growers and farmers. 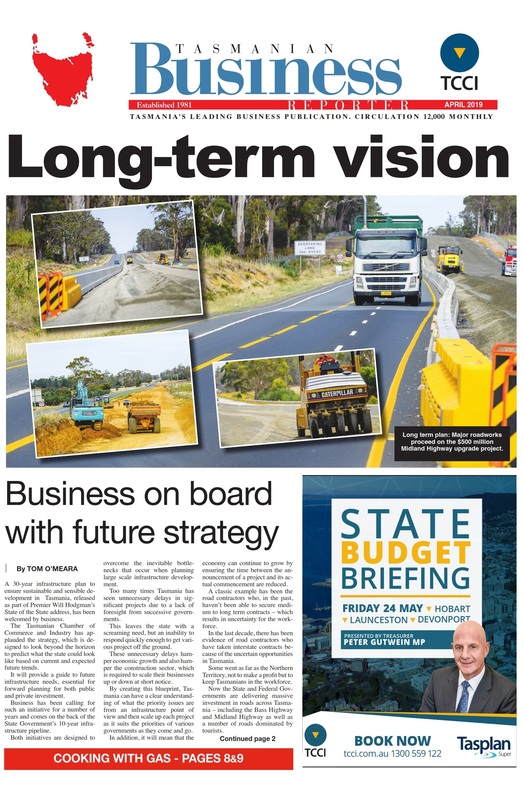 The Tasmanian Business Reporter will publish a special pre-election edition – online from February 22 with the print edition distributed from February 23 – featuring comprehensive details of the latest Labor and Liberal policies.